Everyone experiences stressful or annoying situations, or even severe crises every now and then. 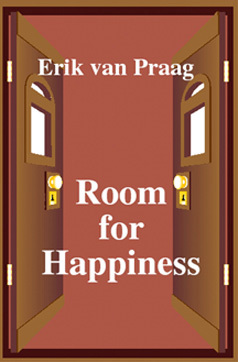 In this book, Erik van Praag shows how you can see these situations as valuable and what they give you. There is always room for happiness. The author shares his own life experiences, ranging from fear of heights to getting cancer, from experiencing being a father to going through a divorce. He shows how you can deal with experiences like these in a way that makes your life richer and more meaningful and adventurous. Room for happiness is an inspiring book for everyone who could use some courage, especially in today's world. For those who already have that, it is an entertaining book that helps you to discover how you can live life to the fullest. .
Erik van Praag, Earthsteward, MA (Psychology) is a business consultant and a Psychotherapist. He also engaged in Peacework in Israel and Palestine and delivered (together with Carien Everwijn and Jerilyn Brusseau) workshops in Essential Peacemaking/Women and Men and Healing the Wounds of War in Germany, Russia, Holland, and several other countries. He was trained in and by Findhorn and Innerlinks as a facilitator of the Game of Transformation.